Since 1994 I’ve had the pleasure of contributing to KUOW’s Weekday while on the road via commentaries and interviews. For our latest trip, I sent in 24 sound clips that aired on the shows “sound of the day” segment. Here are the final four clips. Never seen this before. I’m used to hearing the tinkle and clank of metal bells on sheep, goats and cows. 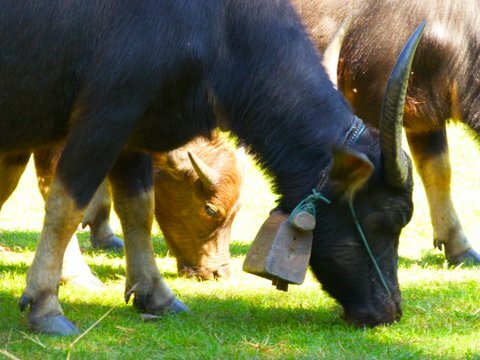 But this water buffalo had a large carved wooden bell around its neck with wooden clappers. Saw several water buffalo with these bells as we pedaled along the Mekong. 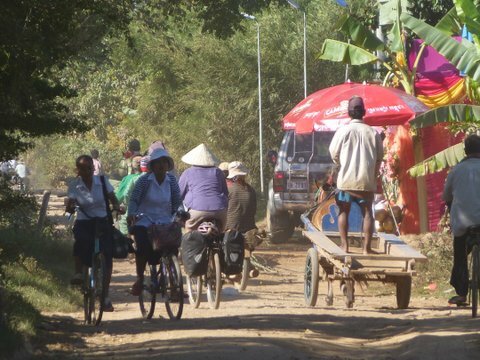 This is a series of vehicles passing me on a small road along the Mekong south of Kratie, Cambodia. First you hear the jingling of sleigh bells. This is a horse passing. The bells are on the horn of the saddle. This is the only region we saw these bells. But all the horses had them. A small car passes and toots its horn. Then there is a looped recording. That is the “egg man”. He is selling hard-boiled eggs to villagers along his route. Rather than having to shout this out a thousand times a day, he has a recording. Heard other “egg men” using this same recording. When I first heard this sound, I thought it was a recording to keep birds out of buildings. Then I found out the real story. Bird nest soup is an incredibly expensive delicacy in China. It is made from the nest of a couple of species of swifts that nest in caves and cliffs. They make their nests from their saliva. The nest is used in the base of the soup. Since the birds normally nest high on cliffs, these nests are hard to come by. So much so that they can go for up to $1500 a kilogram! But some folks discovered that these swifts can also be enticed to nest in old buildings. This was so lucrative, that buildings are now specifically being built just for the swifts in coastal towns throughout SE Asia. Sometimes you’ll see a building with four floors for human occupants, and then three or four upper floors for swifts (see photo). The recordings are played throughout the day and much of the night. If you get up early, you’ll see swifts pouring out of the buildings to go out and feed, and at night swooping back in. 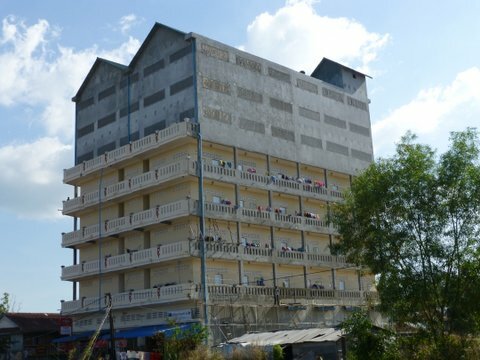 Some towns have so many buildings converted to swift homes, that the noise can be overwhelming. And, as with so many lucrative investments, the chances of a bubble and then a crash are high. But as long as the profit margins are high, this sound will be heard in more and more coastal towns. 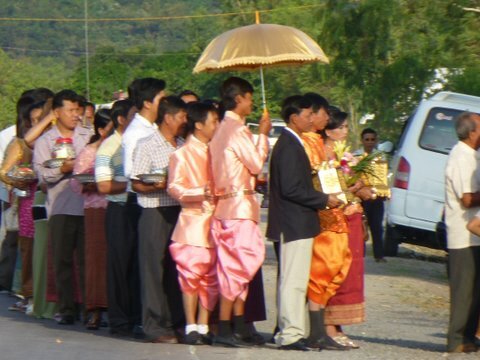 We have pedaled past many a wedding party this past month in Cambodia. Tents are set up, speakers are raised on poles, and music blasted throughout the community. A live band often plays during the ceremony, and this recording is of live musicians. The wedding party was out on the side of the road waiting to enter the big tent. Many had gifts for the bride and groom–baskets of fruit, a case of beer, two live ducks in a basket … no cheese domes, or fondue pots … but maybe we missed those.